Brit Decor : Home Page: Brit Decor: 5 ways to create a knockout look with wallpaper! Brit Decor: 5 ways to create a knockout look with wallpaper! It was not so long ago that wallpaper went through somewhat of a downward trend and became second choice in the world of home decorating - trumped by a growing number of paint suppliers, with homeowners and designers turning to liquid decor as their new medium of choice. However, things are different now and wallpaper has come back fighting, with new effects such as 3D papers, exciting wallpaper murals, and even a new PVC wallpaper suitable for heavy kitchen use! Faced with a tidal wave of paper-based innovation we now have the potential to create some truly eye-catching results in our own homes as wallpaper can tick all of the decorating boxes; colour, pattern and texture. 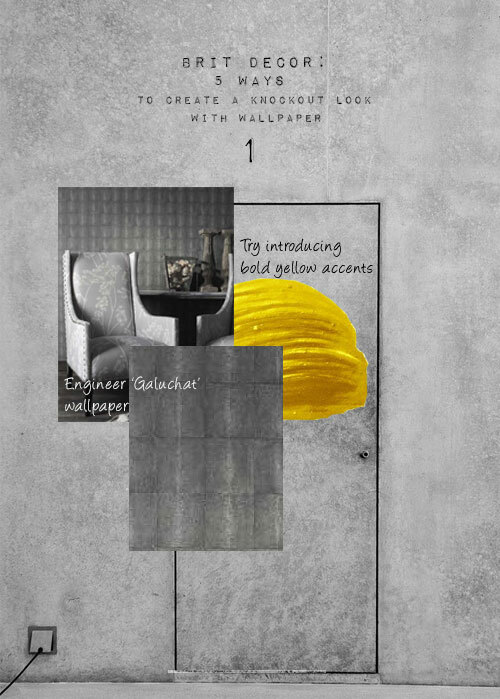 In light of this renaissance, wallpaper is now back in the spotlight as an on-trend material for design conscious homes, so I was instantly filled with creatively fuelled excitement when the team over at The Best Wallpaper Place asked if I'd like to work with them. As a result I have compiled my top five picks from this online store's extensive collections of wallpapers, murals and wall stickers, and I'm showing you how to pair these with co-ordinating accessories and decorative finishes for maximum impact. No.2 Osborne & Little's Persian Garden Penguin featuring some classic designs from one of the best loved publishers in the world, is fun, vibrant, and makes for a great conversation piece. 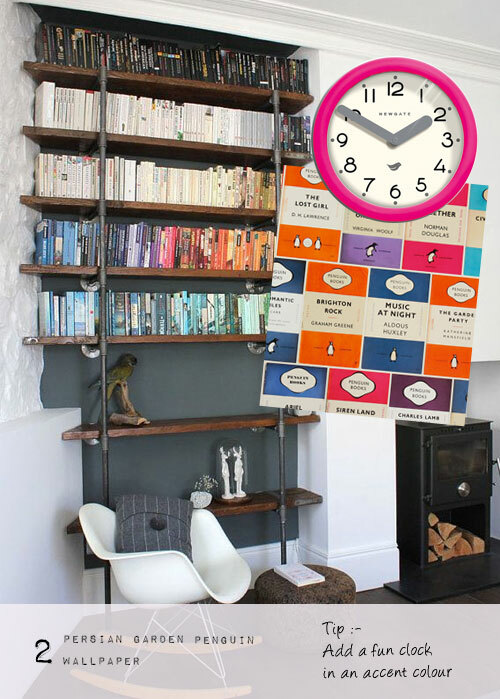 There are plenty of bold colours to choose from in this design, so consider choosing one or two of these and co-ordinate with colourful accessories such as this bright fuchsia pink wall clock. No.3 Xanthina Jackson Flock wallpaper in 'Neptune' has a strong presence and will make a bold statement in any setting. I love the classic blue and white colour combination in this design which paves the way for a rich palette of accented blues. 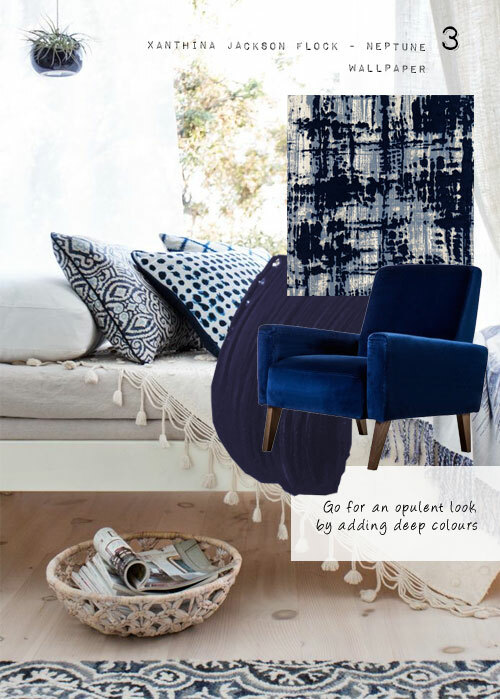 To replicate this look at home, try adding dramatic dark blues and velvet textiles to this wallpaper, for a truly opulent look. 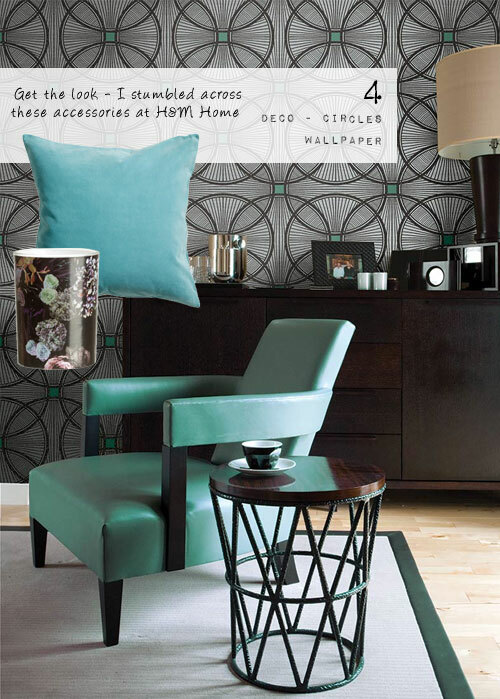 No.4 There is more than a strong hint of Deco-inspired elegance in this Deco - Circles design. I'm a huge advocate of pairing darker grey tones with brighter colours such as this striking dash of turquoise, which forms the central point of each circle. Add some Art Deco-style accessories in co-ordinating colours and you'll have a strong design statement on your hands. No.5 Time to exploit this season's 'look' of the moment! 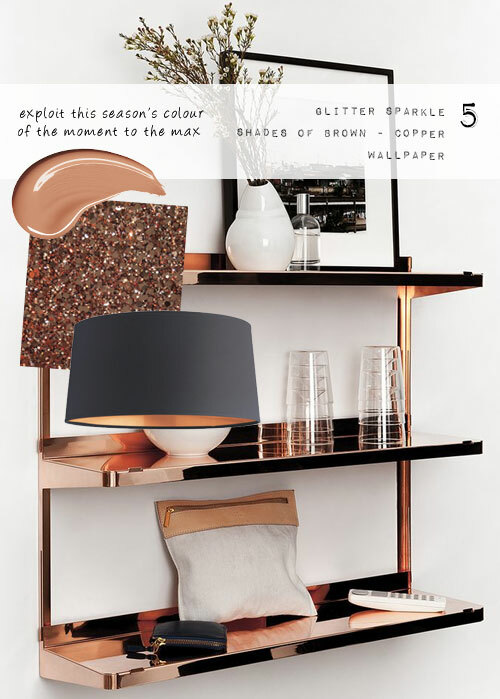 The Glitter Sparkle, Shades of Brown wallpaper from The Best Wallpaper Place's new glitter range, really hits the mark in this rich Copper tone. The glitter effect will ensure that light is bounced from this design to add a touch of glamour to any room. Think about pairing this with a matt surface such as Dulux's 'Copper blush' emulsion for a contrasting texture, and mix with copper-themed accessories for a 'high end' gloss finish. My favourite look is number 4, love the turquoise against the dark wood and grey tones, I do have a weakness for Art Deco!